Keep your vehicle performing at its best by replacing dirty filters. BRIGHTON, Mich.- We're always urging you to stay up to date on your vehicle's routine maintenance, and The Works Package is a great option to keep your vehicle in great shape. But, you may wonder When To Replace Your Vehicle's Filters, and for that matter, which filters need to be replaced. Well, your Genesee County Ford Dealer has everything you need to know about When To Replace Your Vehicle's Filters. First off, your vehicle's filters are not like your home's filters; they don't need to be replaced with the changing seasons. Your vehicle's filters should be replaced instead based on usage. 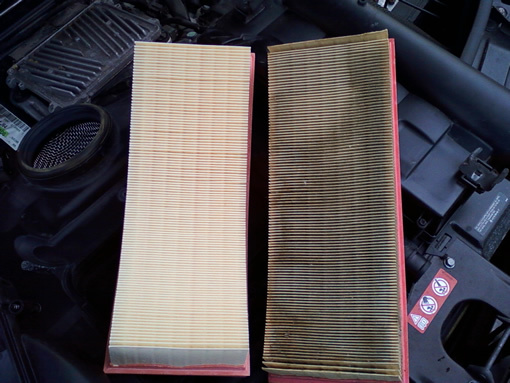 Therefore, if you use your car more, you will need to replace your vehicle's filters more often. Now, there are three filters in your vehicle that you should be aware of: the engine, cabin, and fuel filters. The engine filter keeps your engine breathing and free of dirt and other particles. Neglecting your engine filter can cause it to get clogged and damage sensors, therefore turning on the Check Engine Light. The cabin air filter keeps the air you breathe inside your vehicle free of particulates and should be checked on a regular basis. Lastly, the fuel filter should be checked and replaced after your hit mileage milestones like 30,000 miles or for some vehicles 50,000 miles. As with all of your vehicle's maintenance needs, you can check your owners manual for more information on When To Replace Your Vehicle's Filters. But, like we said, The Works Package is a great option to help maintain your vehicle. You can save on all of your routine maintenance at Brighton Ford with our Service Coupons.